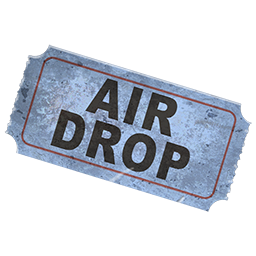 Airdrop tickets allow you to call in-game supply drops. Keep your eyes on the sky from where you make the request. It's on you to make sure you get there before your fellow survivors and you might have to fight for it. Airdrop contents are selected at random, but will contain a combination of items such as weapons, ammunition and various survival supplies. Lately we've had some trouble with zombies in the supply crates, so be careful when it arrives.